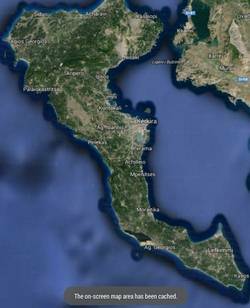 Ever wondered why there are so many ATMs on Corfu these days? It's because the banks have discovered a trick of processing transactions in pounds instead of euros allowing them to use their own exchange rate, a process called Dynamic Currency Conversion (DCC). The table below shows the comparative cost of obtaining €100 from the most common ATMs if you follow the default option of processing the transaction in GBP, and looking at the receipts left behind by other customers most people are still letting the ATMs steal up to 10% of their holiday money. If you ignore all the inevitable warnings and choose the other option to do the exchange in Euros, you will find that they will cost significantly less as the bank have to the use the Visa Exchange Rate in the transaction. This should apply to any ATM that you use and you must be given the choice. It's also a trick being used by some retailers and restaurants. It is generally accepted that if you are ever given the choice to make a card payment in GBP always decline the option and pay in Euros as you would expect. 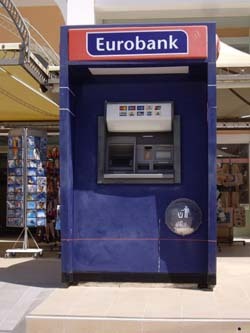 Avoid Euronet ATMs like the plague! All the rates were checked within an hour on the same Sunday afternoon in October 2018 using a Nationwide debit card which charged a £3.44 fee for transactions processed in Euros (included in the cost above). Transactions processed using DCC will not usually incur an additional UK charge unless you use a credit card. This will work on iPhone, iPad & Android mobile devices running an up-to-date version of Google maps. To make a map available for offline viewing just search for your desired location and get it up on your screen so that it only shows the area you want to save & put 'ok maps' into the search box. 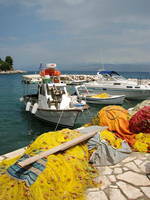 The small fishing village of Kassiopi is on the north eastern tip of Corfu. Kassiopi is an attractive resort with traditional narrow streets and overlooked by the ruins of an ancient castle. Nightlife is quite lively with a variety of tavernas and late night bars around the harbour area. The beaches within Kassiopi are all small and pebbly, but the water is clear and blue. There is a daily bus service to Corfu town 22 miles away taking a winding road that leads around the foot of Mount Pandorkrator giving great views towards Albania. Sidari, in the north of Corfu, is a long-standing favourite with families and singles alike, thanks to its excellent beaches and lively nightlife. The main beach is a two mile curve of sand and shingle, with safe swimming and a good selection of watersports. Beyond the harbour, the sandstone has been eroded by the sea creating a series of tiny coves. The resort's main street is packed with shops and a wide choice of tavernas and music bars. Sidari is a popular choice with all kinds of holidaymakers... just check your accommodation isn't on the busy (noisy!) main street. 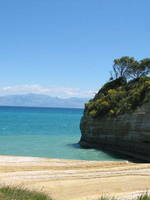 Agios Georgios has one of the best sandy beaches on the island (6 miles long) and safe for children. The beach is well organized and has been awarded the blue flag. The resort itself lacks character, but it's an ideal base for those who like walking and cycling. Those wishing to explore further will probably need a car although there are some excursions available. If you are looking for peace and quiet and are planning to spend most of your holiday on the beach, then St George could be the place for you. 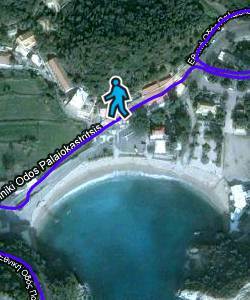 Corfu WalkAbout puts street view style tours into most of the resort maps. 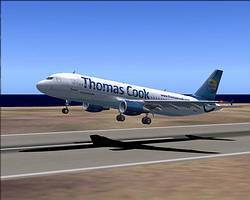 All you have to do is drag & drop the little blue man on to the line indicating the availability of the WalkAbout imagery. With zones for kids aged four to eight, families, and adrenaline-seekers, including the near-vertical Free Fall slide, plus sun loungers, umbrellas, and a full range of bars and cafes, there really is something for everyone. Spend a beautiful morning or afternoon surrounded by nature. Experience a unique journey on horseback through unspoiled forests, along remote beaches and taking in breathtaking views. © 2001 - 2018 All Rights Reserved.